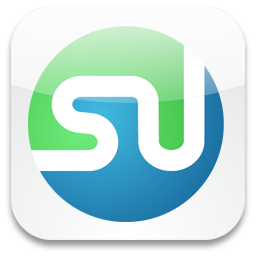 For those of you unfamiliar with all the beauties of the Interweb, it has provided the world with a wonderful invention called StumbleUpon. This site allows you to choose from a set of interests and based on those interests, sifts through the entire web and finds sites that pertain to those interests. Needless to say, its the most interesting and informative procrastination tool currently available online. So far, I’ve stumbled upon sites that tell you the psychological aspects of color, and other sites that generate random facts at the click of a button. Strangely, I’ve been most impressed at a site that combines two categories I’ve subscribed for: Movies and Humor. The site is titled Movie-A-Minute. Movie-A-Minute doesn’t look like it’s out there to impress anyone. It’s format is free of modern day graphics. It might as well have been started in 1997. 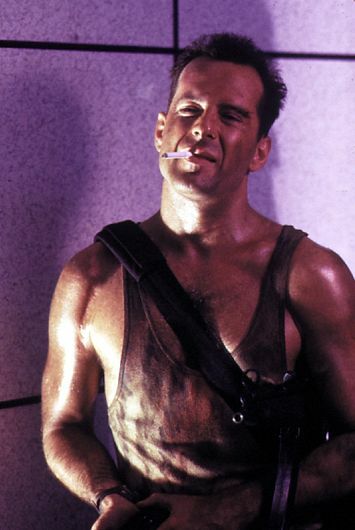 However, Movie-A-Minute is a triumph of substance over style. Movie-A-Minute seems like a hilarious online trend I’d have expected to reach the masses a long time ago. Yet, this site seems both too obscure, and way more intelligent than anyone could ever give it credit for. In fact, this site seems perfect for a generation who’s attention span is supposedly shrinking more and more thanks to the multi-tasking provided by the Internet age. With no one seeming to have anytime to sit down and watch a full movie these days, Movie-A-Minute is there to both hastily fill us in on a movie, make fun of a movie, and then make fun of us for not actually sitting down to watch the whole thing. Side Note: In order to stay relevant, I would like to announce that today Anne Hathaway and James Franco were announced as co-hosts for the next Academy Awards. I can’t say anything too bad about the decision, seeing as Franco is hilarious (and will hopefully get an Oscar nomination this year) and Hathaway is a skilled entertainer. However, can the Academy please just get an actual comedian back onstage again? It’s time for the Hollywood elite to learn that everyone needs to get made fun of every once in a while. This entry was posted in ADD, Anne Hathaway, Bruce Willis, Die Hard, Internet, James Franco, Movie-A-Minute, Procrastination, StumbleUpon on November 29, 2010 by ian0592. Once again, a Danny Boyle film begins with the simple act of running. This time, it is not one person running, or even anyone running for some sort of purpose. It is just people running. Running because they can. Rushing because they want to. Why open the movie this way, when the hero isn’t even present? It’s because understanding the adrenaline rush all humans search for is the only way to make sense of the strange, infuriating, and painful journey the hero of “127 Hours” will endure. 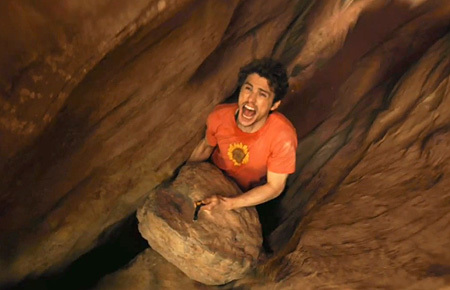 “127 Hours,” takes the idea of Realism to an almost unseen level. It is based on the true story of Aron Ralston (James Franco), a mountain climber with a reckless need for adventure. One day, Ralston leaves his comfy Los Angeles apartment for a trip into the American desert, and ends up at the bottom of a canyon with his arm stuck under a rock. And this all happens while he is completely alone. “127 Hours” is basically a one man show. That doesn’t mean there are no other good performances, it just means that Franco’s performance is the only one that really matters. Had he failed in his role, “127 Hours” also would’ve failed. However, Franco is better than that. I’ve usually found Franco’s best performances to be in comedy, but with “127 Hours,” he proved he is just as good (if even better) in drama. What is so perfect about Franco’s performance is that it doesn’t even feel like he’s acting; he’s reacting. He does exactly what anyone would actually do if stuck in Aron’s situation. What is eventually so haunting and memorable is how much he acts through facial expressions rather than words. It’s a rare talent to show such emotions as desperation and intensity without saying anything. Usually, it’s the filmmaker, not the actor, who is told to show, not tell. Franco proves that actors should begin to take on this burden as well. Everyone else who worked on this film is as meticulous in their field as Franco is. Those quick, narrow cuts so perfectly serve the claustrophobia of the location. The cinematography also captures the dramatic American landscape so flawlessly. Most of all, Boyle has impressed me more and more with each film he makes. Boyle could be accused of being one of the worst offenders of over filmmaking. “127 Hours” randomly contains shots ranging from the inside of a water bottle to the inside of a bone in someone’s arm. Usually, these would just be detours in a film. But in “127 Hours,” they are the tiny details that truly emphasize this man’s incredible quest for survival. It is funny with all of the over filming how much at times “127 Hours” doesn’t even feel like a movie. At times, it doesn’t even feel like a pseudo-documentary. It feels just like a slice of reality. Boyle’s most amazing talent is his ability to see that it’s not just about what’s being filmed, but how it’s being filmed. “127 Hours” might have been a preachy, cliche story in another’s director’s hands. With Boyle, it is a nail-biting adventure, even if the ending is already known. One of the best examples of this is during the rain scene. There is nothing interesting about a rain storm. However, there is a lot interesting about it if you slow it down and turn it into a frightening, unstoppable force of nature. Boyle has always been a highly stylized director, and “127 Hours” is certainly a highly stylized film. Boyle has the rare gift of turning style into substance. Not only does he make such an interesting adventure, he also makes such an interesting character. Aron reminds me of a modern day Christopher McCandless, but with more knowledge of how to survive in nature. Like McCandless, Aron is a people person who doesn’t act like one. He seems to only be able to connect to the world by foolishly isolating himself from the people he loves. This could also be because he defines the McCandless mentality: one has to prove themselves worthy by doing it alone. Maybe it’s because men feel they have a special one-on-one connection with nature or they feel nature must be tamed. The lesson Hollywood seems to be teaching us is if you’re trying to go on a dangerous trek through nature alone: always leave a note. In the end, “127 Hours” shows a new Boyle who is more emotionally effected by tragedy. It contains an ending that could’ve bordered on base sentimentality but is instead truly moving and deserving of a good tear or two. Aron Ralston, despite being selfish and aloof of reality, really deserves a hero’s welcome simply for his amazing will to survive and thrive. One more note before I leave will be of the scene everyone is talking about. If you know the true story or have read the articles, you’ll know exactly what I’m talking about. Yes, it’s shocking, gruesome, and hard to watch. However, don’t let those few very negative reactions of one scene shape your entire opinion of the film. 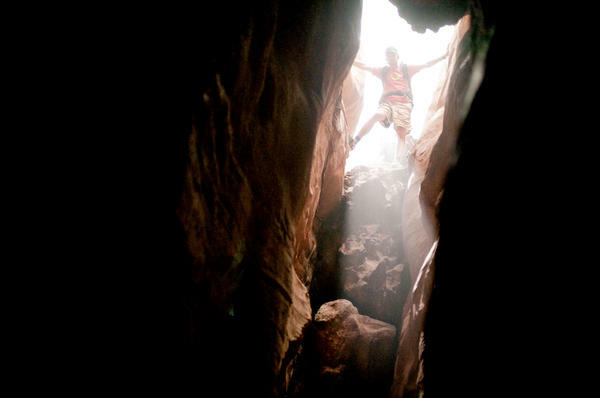 “127 Hours” is a film too big, and too meaningful, to be judged on one scene alone. This entry was posted in 127 Hours, Adventure, Biography, Danny Boyle, Into the Wild, James Franco, Movie Review, Pseudo-Documentary, Realism, Survival Story, Thriller on November 24, 2010 by ian0592. If you’re someone who occasionally snoops around this blog, you might have noticed something recently: new posts aren’t coming. No, I haven’t died. No, I haven’t suddenly lost my interest in movies. And no, The Reel Deal is not reaching its end anytime soon. It may just be reaching a new stage in its short yet sweet life. Let me just warn you that this following post has nothing to do with any particular movie. I also don’t want to justify my “laziness.” I would just like to explain, and make it loud and clear that The Reel Deal isn’t going anywhere. What has happened to me? Well, I went to college. For those of you who don’t know, college works a bit differently from high school. Time functions differently. Sleep happens sporadically, and even rarely. Worst of all, time really does fly. One day is never enough time to accomplish something. Even with so much free time, there is always something happening, something else to be doing. In this time, I unfortunately lost sight of my defining source. Those days when enlightenment seemed to come from the cinema and discovery came from writing about it somehow got muddled. I began to forget that feeling, that so-called ecstasy of cinema. I didn’t try to lose this on purpose. The last time I remember feeling this was the last time I walked into a theater to see “The Social Network.” That was a movie that was just about so perfect in every way that it made me wish every movie I saw could be just as good. So maybe in that respect I can blame Hollywood. They’ve released few movies so far this season that seem worth taking that forty minute bus ride to the mall. Oh yeah, finding a movie theater in upstate New York can become even more of an adventure than an actual movie itself. But while there is nothing like a good movie, I’ve found those pleasures of the best cinema can even be found in real life. What is that feeling? It’s the feeling of finding something amazingly unusual in such a normal situation, such as a beautiful spring day in the middle of the gloom of November. At this point, you probably wished I would stop writing this piece. What is the point of this if I’m not analyzing a movie or complaining about how much I hate Michael Bay? Because I want to reassure you that The Reel Deal is not dead and never will be. It’s simply heading in a new, uncharted direction. I don’t know what direction this blog is headed in, just as I don’t know what direction my film major will take me. Then again, life is more fun that way. This entry was posted in Uncategorized on November 12, 2010 by ian0592.